Visit one of the 7 Mossy Nissan locations on Friday 5/25 or Saturday 5/26 to enter! 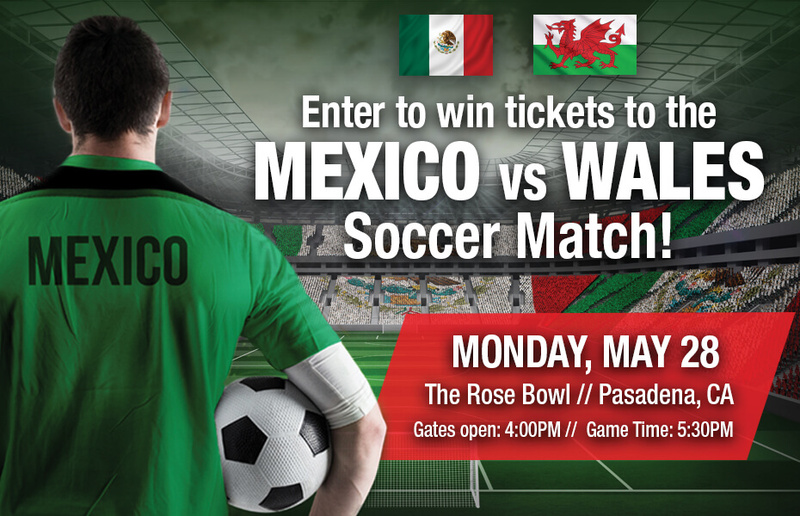 20 entrants will win the grand prize of two tickets to the Mexico vs. Wales Soccer Match on 5/28/18 at the Rose Bowl in Pasadena courtesy of Mossy Nissan. The grand-prize winners will be chosen randomly and notified by email on Sunday, May 27, 2018. Winners will be given 24 hours to claim prize. The grand-prize winners will be responsible for picking up the tickets from the Mossy Nissan National City. Odds of winning depend on the number of entrants received. By participating, entrants agree to be bound by these rules. Winners will be chosen and awarded at Mossy Nissan’s sole and absolute discretion. The prize awarded is not transferable and is not redeemable for cash. Entry forms must be submitted by 9:30 PM PST on Saturday May 26, 2018 to be eligible. If an entrant is found ineligible or if they do not comply with the Official Rules, then the entrant will be disqualified and will not receive the tickets. Entrants must be 18 years or older. Employees of Mossy Nissan and affiliates of its advertising and promotional agencies and their immediate families and any persons with whom they reside are not eligible. By entering the giveaway promotion and accepting the prize, the entrant (a) releases Mossy Nissan from all liability with respect to this contest, including entry and participation and use of the prize awarded herein, and (b) except where legally prohibited, consents to the use of his/her name, entrant photo and likeness in print, broadcast, internet, social media and other media for advertising, promotional and/or marketing purposes without additional compensation. Mossy Nissan reserves the right to cancel, terminate, modify or suspend this promotion. This contest is void where prohibited or restricted by law and is subject to all applicable federal, state and local laws. By participating in this promotion you agree to Mossy Nissan of any responsibility or liability for any damages or losses of any kind, including direct, indirect, incidental or consequential or punitive damages arising out of or relating to the delivery, use or performance of the prize(s) or products and services purchased with the prize(s), including any warranty of merchantability or fitness for a particular purpose. For a copy of the Official Rules, print this page.